The GRD-2 has two relays. It replaces two different Linear gate receivers, the DRG-2 and the DRG-2-LV. 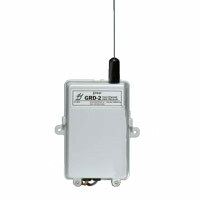 The GRD-2 is a digital receiver designed for use with automatic gate operators or systems where a remote antenna is needed. The GRD-2 will operate two gates, one gate and an obstacle sensor or channel one can open the gate and channel two can close the gate. All of the Delta3 transmitters, including the two and four-channel transmitters, are compatible with the GRD-2. The Delta3 radio format provides 256 different digital codes. The codes are set using the 8-position coding switches 310 MHz frequency in the units. In order to avoid the possibility of duplicating codes in adjacent systems, factory set codes should not be used. The receivers can operate from 16-24 volts AC or 20-30 volts DC and are normally powered from the gate operator. The relay contact(s) are rated at 5 amps @ 32 volts AC/DC NEC Class 2 circuit. The GRD-2 has a “F” connector for attaching an antenna. The receiver is supplied with a 9-inch local antenna, a three foot 75 ohm coaxial cable, and a bulkhead connector for mounting the antenna outside the gate operator enclosure.